Dr. Graeme Parkes, Executive Vice President - MRAG Americas, Inc.
Dr. Parkes holds a Ph.D. in fisheries science from Imperial College, London. He has thirty years of professional experience in fisheries evaluation, monitoring and management, resource assessment, fishing capacity management, and fisheries certification systems. Dr. Parkes has worked within the MRAG family of companies since 1994, occupying senior management positions both at MRAG Ltd. in London and MRAG Americas in the US. Dr. Parkes is responsible for core business areas and functions of the company, including primary responsibility for staff supervision and project deliverables. 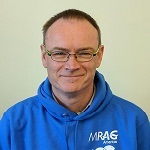 During his time at MRAG, Dr Parkes has been responsible for the setup and management of several major international scientific observer programs, including EU observers in the northwest Atlantic (NAFO), UK observers in the Antarctic (CCAMLR), ICCAT observers on bluefin tuna farms in the Mediterranean and longline transshipment observers in the Atlantic and Indian Oceans for ICCAT and IOTC. His other project experience includes development of a global benchmarking of fishery certification standards for GSSI, modelling relationships between fishery management strategies and MSC certification scores, performance evaluation of Rights Based Management (RBM) in European fisheries; review and benchmarking of marine fish ecolabelling programs; assessment of fisheries under the Marine Stewardship Council certification standard; review of US federal budgets for reducing scientific and management uncertainty in fisheries; review of funding of monitoring control and surveillance of European fisheries; and evaluation of scientific support arrangements for Regional Fisheries Management Organizations. Dr Parkes was a member of the EU Scientific, Technical and Economic Committee for Fisheries (STECF) between 2007 and 2010 and a member of the UK delegation to the Commission for the Conservation of Antarctic Marine Living Resources (CCAMLR) from 1991 to 2011; he was the UK Representative to the CCAMLR Scientific Committee in 1999, 2010 and 2011.